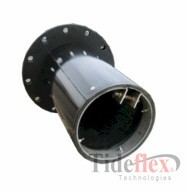 The Tideflex Series 37-G Thimble Insert is comprised of a Series 37-G Duckbill Check Valve mounted in a thimble. The 37-G is pre-assembled, clamped and pinned into the thimble prior to shipment. The Thimble Insert can be provided flangeless or with a circular or rectangular flange and the 37-G can either face the flange or away from the flange depending on the installation orientation and flow direction. The flangeless Thimble Insert is inserted into a pipe and grout is injected between the pipe ID and thimble OD to provide a seal. It is also recommended to pin the Thimble Insert to the pipe. The flanged Thimble Inserts are inserted into a pipe then anchored to the concrete wall. The flange can even be fabricated with a radius to match the inside radius of the manhole. Gaskets are provided with flanged Thimble Inserts. The Tideflex Duckbill Check Valve is a revolutionary design for backflow prevention. Tideflex Valves are a one-piece rubber matrix of numerous natural and synthetic elastomers and ply reinforcement, similar in construction to a truck tire. Tideflex are cost-effective because they do not need periodic maintenance or repair to keep them operational and they have a 30 year operational life span. Tideflex operate using line pressure and backpressure to open and close so no outside energy source is required. The valve has an extremely low cracking pressure so the valve self-draining which eliminates standing water and maximizes storage volume in the upstream pipe. Tideflex Valves have low headloss, they do not rust or corrode and are not affected by UV so performance and reliability is constant thru the life of the valve. The flexibility of the Tideflex allows the valve to compress around trapped solids providing a much better seal than flap gates, as confirmed by the USEPA. With the development of the patented curved bill, sealing capabilities are even further improved because the curve bill is more flexible than the rest of the valve and therefore compress more around solids. For higher backpressure ratings or to lower headloss while maintaining backpressure ratings, the Saddle Support Technology (SST) can be used in conjunction with the Series 37-G.